We focus all of our thoughts and actions to the satisfaction of our customers. 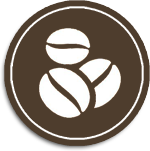 We want to transfer our passion for quality coffee to our customers. In addition to the best services we oblige to provide, very important to us is the communication with our customers. You receive the highest of quality in the lowest prices ever. All the products we offer are of exceptional quality, as we frequently import small quantities in order to ensure absolute freshness. To us, a truly well prepared cup of coffee is one of the greatest pleasures and because of our continuous contact with coffee in our espresso bar we are in the position to offer the best known and most tasteful blends of coffee worldwide. Orders placed until 12.00, are processed and shipped the same day. Order even one single product - there is no minimum amount order. Update via email for shipping and tracking number (tracking number). Security whilst browsing thanks to the security protocol of our website.